Boaters have a special bond with the waters that they enjoy. They treat them with the respect that nature deserves, and occasionally demands, from those of us who venture upon the seas. One dimension of our responsibilities comes from the many things that we bring to our boats that can affect the environment – fuels, oil, food, chemicals, paints, cleansers and gray and black water. Keeping pollutants in their place and disposing of them properly is critical to keeping our waters clean and usable for others, and for those who will follow us to Canada’s lakes and rivers in years to come. At Collins Bay Marina, we are participating in a widespread effort to ensure the environmental friendliness that boaters wish to practice. We ask each member of the marina to sign our Clean Marine Policy – a pledge to properly manage potential pollutants in parallel with our efforts to manage our facility in an environmentally responsible manner. Boaters agree to a series of commitments that encompass both common sense and the regulations under which we operate. The response to the Pledge has been overwhelmingly positive. Of the hundreds of boaters that have been asked to consider and sign, all but a handful have readily agreed to the terms. Further, most of them have endorsed our initiative and thanked us for providing leadership for the conservation efforts. As a token of our appreciation for their participation, each boater has been given a “bilge buddy” oil absorbent sock which separates oil from water so that oil can be properly disposed of rather than being pumped overboard with the bilge water. Boater enthusiasm for receiving and using them has been excellent. Our Clean Marine Policy stems from a much broader initiative called the Clean Marine Program. 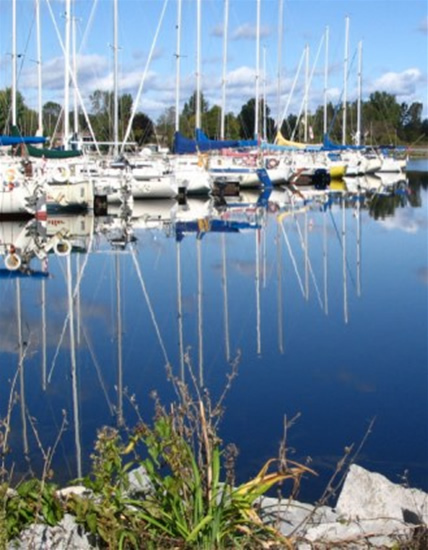 As a founding member, Collins Bay Marina was instrumental in the initial development of this nationwide program. 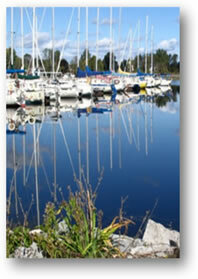 The Clean Marine Program promotes environmentally responsible best management practices for marinas and clubs. Performance and compliance with the program is then measured by extensive audits and ranked by an independent organization – Terra Choice Environmental Services. 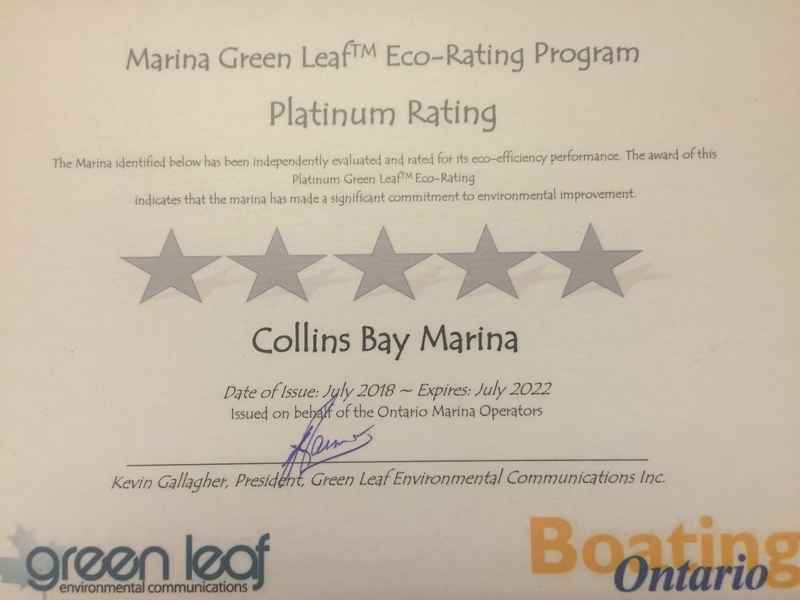 We are proud of the fact that the clean marine initiative continues to be well received and favorably adopted by the boaters of Collins Bay. Through increased awareness among our boaters, it has moved from an educational process to an accepted norm of behavior Care in working with and proper disposal of hazardous materials and attentive recycling practices are all well established. Thank you for your active participation in keeping our waters safe and clean for all of us, and for our kids. We would be pleased to discuss our efforts with other marinas or clubs, and with boaters. Together we are making a difference. In 2018 we have achieved our rating of Five Anchor Platinum! This is the highest award given for our commitment to protecting the waterways in which we work and play. 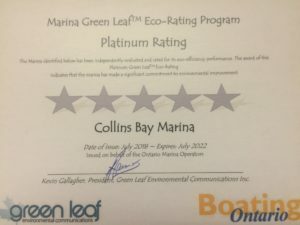 The award of this Platinum Green Leaf Eco-Rating indicates that Collins Bay Marina has made a significant commitment to environmental improvement. We are proud to have reached this rating! We provide facilities free of charge to recycle waste oil, antifreeze and lead/acid batteries. We realize that most people will not have access to a proper dustless sanding system so we have purchased an industrial unit that is efficient and easy to use. We rent this equipment to our customers at reasonable rates. Recycling bins are provided for cans & plastic, glass and paper/cardboard. Through our Green Marine pledges that we ask each of customers to take, we detail common sense approaches to keeping our environment clean. We instigated the practice of providing free bilge socks to boaters who signed our Green Marine pledge. Shoreline construction is of sloping natural rock rather than the steel / concrete vertical shore wall to allow the proper interaction between aquatic and land based life. Parking areas are gravel rather than paved to insure that automotive waste is not directly washed into the surrounding waters. We minimize power consumption wherever possible through proper lamping, timers and motion sensors. Man often interferes with nature and nowhere is it more evident than in our desire to be on the waterfront. We work at being conscious of our footprints.